May your New Year be above all marked by good health – that is what most reasonable people will say as we enter the end of 2010. But for wine and food lovers, may it also be full of great bottles. That’s right, because, especially for older wines, one talks less about the wine and more about the bottle (and cork): how and where the wine had been stored, how a particular bottle evolved… Wine does not always age the same way in each bottle and such differences are more pronounced as time passes. 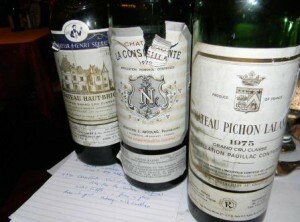 Thus we were rather lucky to have opened some truly fine bottles, with no cork issues and all wines showing very well. And what wines they were! Each of us – seven participants (Chris Bublitz, Ken Brown, Howard Cooper, Randy McFarlane, Kevin Shin, Chris Sipes and myself) – brought nice wines to taste over a fine dinner at Lavandou, one of the most BYOW friendly establishments in Washington D.C.
We started the evening off with a nice Champagne, which Howard had purchased at Arrow Wine. The Le Cotet Blanc de Blancs by Jacques Lassaigne Brut provided good lemony citrus notes, with a slight thickness on the mid palate coupled with a certain steeliness on the finish. It gave the overall impression of being brisk and rich. Then came a pair of Dom Perignons: the 2002 and the 1996. Kevin brought the former, which was evidently youthful in profile, full of bubbles and energy and combining lemon zest, peach, buttery aspects and slate. Somewhat impenetrable – compared to the 1996 – but showing grand potential. I recall adoring this with Michael Lux in Alsace so much in November that I bought a six pack without much after thought and intend to buy more. Amazingly, Kevin told me that a couple of critics do not like this wine. I cannot understand what there is not to like, but it is now waaaaaaay too young. Not so the 1996, which I had brought – and I have three more… My goodness I loved this wine. It seems to have just as much focus as the 2002, but perhaps a bit more body, allowing for the age difference of course. And then, given the age difference, it is far easier to enjoy today, with yeasty notes, chalk, floral aromatics, hints of iodine, warm and giving, with a full-bodied Burgundian feel and a lingering finish. 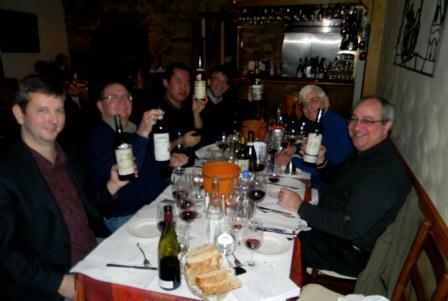 Thanks to Randy for our first pair of Italians: The 2001 Giacosa Barbaresco Asili pleased everyone. 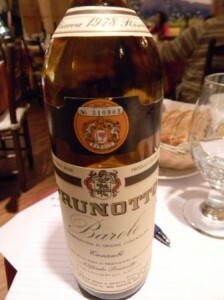 It was a wine that conveyed a sweet fruitiness but with good texture and ample body. I got hints of vanillin, and also enjoyed this wine very much, which would evoked pleasure each sip. But for me, when we talk of pairs, I found the 1996 Luigi Einaudi Costa Grimaldi Barolo to be the more impressive wine. Certainly on a slower evolutionary track, with more foreboding tannin and a certain acidity. It began just slightly metallic, but with time in glass, it turned to perfumed aniseed and sour cherry with a layered mineral aspect. Somewhat dense yet also layered on the palate which seemed barely open compared to the Barbaresco. Both wines impressed. So it was with great interest that we encountered another pair of older Italians. We first went to the Francesco Rinaldi Barbaresco 1964 which Chris Sipes brought to the dinner. After an initial whiff of burnt caramel, which scared me a bit (this is perhaps the oldest Italian wine I have yet tried so not much experience here! ), the wine turned wonderful, displaying freshness on the palate with stewed cherry, some aniseed (again) and above all good energy on the palate which belied its age. 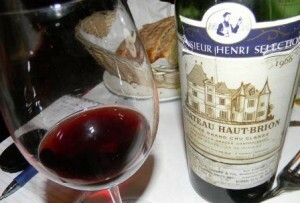 Howard and others remarked that they would not have guessed this wine to be so old. Over time, I also got some tarry notes that complimented the overall feel. We then opened Kevin’s 1978 Prunotto Barolo from the celebrated Cannubi region, a reserve bottling meaning at least five years of aging, including three in oak. Kevin remarked this to be an old school wine, and I was very happy to have enjoyed it, as it displayed a certain butterscotch like sweetness coupled with licorice and cherry, so typical of Barolos, given my limited experience. The texture was suave and rich, with energy. It went well with the duck rillettes I had ordered as an appetizer. Chateau Haut Brion 1966. Thanks to Ken for bringing this fabulous bottle. Once again an example of an exquisite Bordeaux that does not have super high alcohol and stresses freshness above bigness. And what freshness you may ask? I could only describe the nose as a mélange of perfumed Havana tobacco and slight hints of truffle. I could not get enough of it, marveling at this wonder. Some remarked that the palate was perhaps not as impressive as the nose’s promise. Yes, there was a certain noticeable acidity, but, over time, the palate just impressed me with its subtle layers of flavor and an overall elegant palate feel – and here the word elegant does not hide thinness. It was a wine that wowed you with finesse, not power. And yet, this was hardly thin. For you cigar fans, it paralleled the feeling of a Romeo y Julieta cigar of the highest quality. 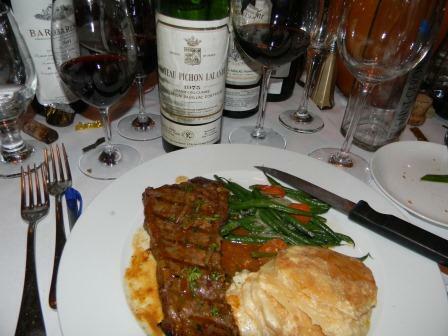 I then could not get enough of Howard’s Chateau Pichon Comtesse de Lalande 1975. This seemed to have the sweetest nose. A Brownie chocolate taste and aroma, but hardly one dimensional. It got more interesting with time in glass, increasingly layered. When you see the prices of Bordeaux today, and you can find this on the market for under $100, I think it would be worth the risk, if the provenance is good, because this bottle was addictive. Here we have a case of a 1975 having shed its tannins rather completely and now thoroughly enjoyable. Given my increasing experiences with Pichon Comtesse, I am liking this estate more and more! Finally, Chris Bublitz brought the Chateau La Conseillante 1970, which proved to be another success, combining a black olive aspect with nutmeg and dark chocolate. It seemed initially more subtle than the Comtesse, perhaps a tad more layered. 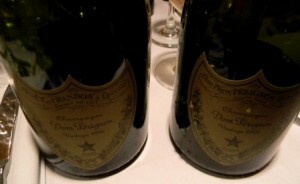 I was not sure which one I liked more, but they both – when coming from a good bottle – are drinking beautifully today. Chris Bublitz also brought a fine Barsac, the Chateau Doisy Daene 1983, which displayed a tobacco like minerality coupled with yellow peach, showing its age on the nose – just a hint of earthiness. I liked this wine for its typical nature, mirroring what one would expect from the Barsac terroir: finesse over power, elegance over richness. It was a pleasure. 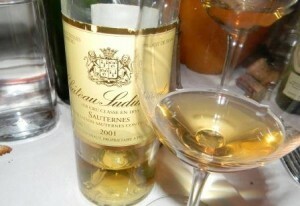 But I really fell in love with the Chateau Suduiraut Sauternes 2001 (half bottle) which Ken Brown also brought. I could not get enough (well, yes I could after all these wines 😉 of its pear and sumptuous nutmeg qualities all expressed with a rich and viscous yet never dense or thick expressions. 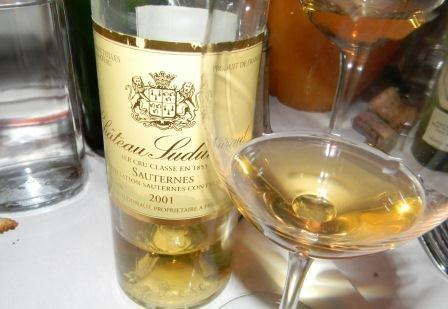 This is just a great Sauternes from a superb vintage, drinking so well today in its youth. Yum! Chris Sipes brought a good German late harvest wine from a less heralded vintage: Selbach Oster Bernkasteler Badstube Riesling Beerenauslese 2006. There was a hint of wet sock on the initial nose but that blew off and I contented myself amply with its subtle Riesling nature: citrus and minerality yet rich and bright. Thanks to all the tasters of this most enjoyable and knowledgeable group. I am lucky to have such friends in Washington who know their stuff, to have learned from them and basically to enjoy good conversation each time we meet. We are not always as lucky when it comes to the wines, so this dinner was particularly successful in that regard. Finally, thanks to Florence and her team at Lavandou for providing good food at a very good price for wine lovers. We will be back soon! In the meantime HAPPY NEW YEAR ! It was great to see you again Panos. 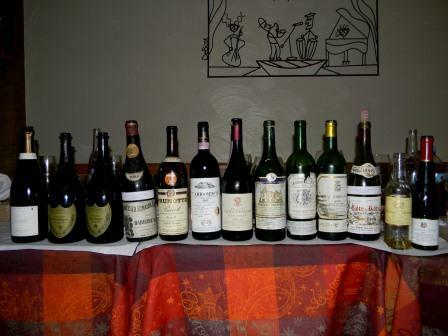 It was an evening of truly memorable wines. I am glad we could welcome you back to DC in this fashion. Nice photos and thanks for the information, I’m big lover of old wine so i always find new flavor of old wine and here i have found it.